The weekend and Monday were cold, grey, and very windy. It did not allow for outside work in my mind. I took to doing things on the boat that can be done in the wheelhouse or down below. I am sure I ran to a grocery store one or two times as this seems to be a regular chore, but I don't remember what I purchased. I have been trying to eat healthy and sometimes I am successful. I hope over the course of the next month or so to establish a good routine in this regard. My mentor came to me on Sunday and made a good suggestion. Since I will be using the Flemish waterways, I need to purchase a permit: a vignette or yearly license. This normally can be purchased at any bridge or lock in the Flemish system. But as the boat is between old and new registration (still waiting on the Belgian boat people), will it be possible to purchase a vignette at this time? Not knowing when the registration number will be issued (there are complications), this presents a possible problem as I need to practice more and the certified trainer will be here in about a week to do training and to certify that I am not a danger to the rest of the boating world. So I decide to take my bike and make the trip to Nieuwpoort which is on the coast of the English Channel and about 15 kilometers from Diksmuide (if you could only see how my dictation is handling these Dutch words). The wind has been strong enough to be rocking the boat, but I am hoping that Monday will be much better. Not much better as it turns out. sweater underneath and heading northwest towards the coast. 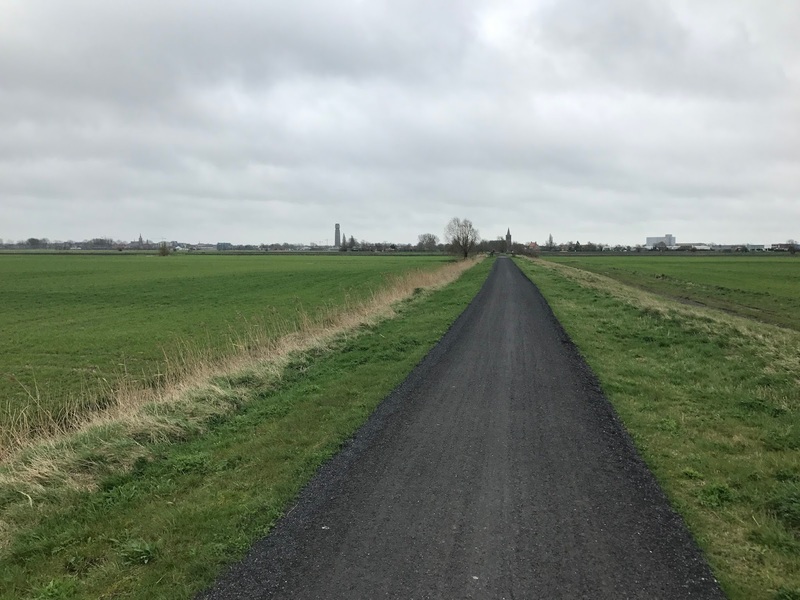 I am lucky that 90% of my trip will be on a dedicated bike path, almost a straight line from the marina to Nieuwpoort. The wind is off to my port side but not too bad and I think that the return trip should be better. I'm using Google maps on my phone as it offers me a bike option whereas the Apple maps do not. I have entered the destination address in both systems on the phone. As I arrive at the Google destination I suspect a problem; this looks like a café and not an office selling boating permits. I go up and down the street a bit and decide the best course of action is to enter the café. I ask my question and they have no idea where the office is that I'm looking for. I sit with the owner for a few minutes and we plot possibilities. I check Apple's map to see what it says and I conclude that it is pointing to a location several blocks north. I think my problems are solved. I thank the café owner and depart for address number two. It looks more like a house than an office but I can see that it is in fact a business. I knock. No, what you are looking for is just on the other side of the street at number 14. I thank the lady and depart. At address number three, I don't see much activity and nothing to indicate there is a business inside. I explore and ultimately end up going upstairs and knocking at the door; it is opened by a lady that I think is cleaning a room that contains monitors showing canal locks and bridges in the Nieuwpoort area. Nonetheless, she says I am getting warmer and she seems to know where to send me. But they all knew where to send me. Looking out the window she says "over there by the chips store" and I am wondering what she means by a chips store but then I see the sign for frites and realize that she thinks I am British (Note from Marianne: I think it is funny that Tim thinks she believes he is British. Maybe, or maybe not. She probably learned that chips is the English word for "frites" and she has no idea that Americans call them fries; she may not know the word "fries"). Go down this street maybe a kilometer, through a boat club, and look for a big building with lots of glass. So off I go. Through the boat club, around some barricades and to the building I recognize as lots of glass. I find no activity at ground level but find the stairs to go up. I open a door and two young ladies greet me. I want to buy a vignette, I say. They say, no problem. So I provide information about the boat; they indicate that it is not a problem not having the boat number. I just have to report it when it's available. I get my usual American discount and pay 130 euros rather than 165. Actually, it is just a discount for purchasing early in the year. I leave rather proud of myself. I still have concerns about going into the unknowns of Belgium. Thankfully, most Flemish people speak passable English. and eateries. 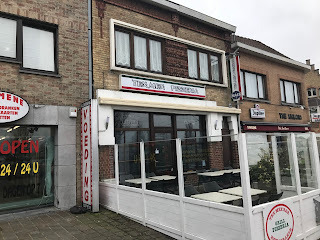 Isn't it wonderful: I find a TexMex restaurant in Belgium. Anyway, I continue and end up in a small café to have a coffee. It is 11:00 AM and quite active in the café. My fellow diners are mostly 15 to 20, maybe 25 years older than me and they are not drinking coffee. It is their first glass of wine and for some, perhaps something a little stronger. And being Belgium, there are three or four dogs under the tables. Outside still windy, cold and a bit wet so I terminate my tour and exit the town using Google as my guide. It makes these wanderings so much easier. I soon realize, once on the bike path, that the wind is at an angle which will make my return to Diksmuide much more of an effort than the trip over. I did not time myself but I think I used many more calories returning to the boat. I have found a new book to read and spend most of the day reading and snacking. I am able to apply the new vignette sticker to the rear of the boat, or should I say stern. I'm good for the rest of the year in Flanders (the Walloon area does not sell a license; the use of the canals is free of charge). I was able to tackle one new thing on Monday and that was starting the generator. Electricity on a boat like ours is important. You need a strong battery to start the engine and you need electricity to operate the lights, the refrigerator, your computers, etc. Without it and without a good generator you can be in big trouble. The early owner of our boat, the Masseys of Canada, had story after story of problems with their generators. But I think in fact the generator that is now on board was his final generator and perhaps it solved the problems. After reviewing my notes in the video I took last fall while on board, I turned the generator on and she roared to life. The downside to any generator is the noise it makes. Maybe newer generators are quiet, I don't know, but ours certainly makes a good bit of noise. But if you consider the alternative, dead in the water, a little noise might be OK from time to time. Tuesday brought much less wind and the promise of some blue sky. I spoke to my mentors and we agreed to head out on to the river after lunch. They and their friend came on board and we departed upriver with plans to practice turns. And we did and I learned a few things each time. We conclude by berthing with a bit of arm waving and questioning looks but we are able to dock without hitting anyone's boat. I call that a good day.